We at Hospital Radio Glamorgan (RG) are looking for supporters to join us in celebrating our station’s 50th anniversary. We are asking businesses large and small to support our extra special fundraising campaign ’50@50’. We are offering a package of benefits that last 12mths to 50 businesses who donate just £50. A professionally recorded advert played throughout the day, or sponsorship of a particular show. This advert can be provided by your business, or RG can produce. A slide on the LCD screen which runs on a loop 24/7. The screen is located outside our studio, on the main hospital thoroughfare, visible to thousands of people every day. A clickable logo on the ‘Supporters’ page of the RG website which will click-through to your business homepage. All we would require from you is a hi-res logo of your company along with a tagline which we would use as part of the LCD screen slide. If you wish to sponsor a particular show, please let us know and we will send you a list of potential shows available for sponsorship. We are a registered charity run entirely by volunteers and provide 24-hour entertainment for patients at University Hospital of Wales (UHW) in Cardiff. We broadcast our service via speakers in areas around the hospital and also online. We have our very own free RG App, allowing people to listen on the move too. 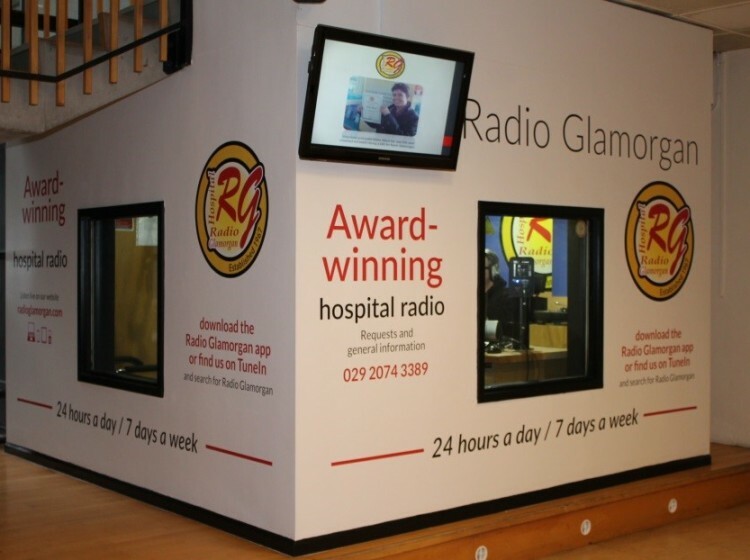 Hospital Radio Glamorgan looks forward to working with you and thanks you for your support.